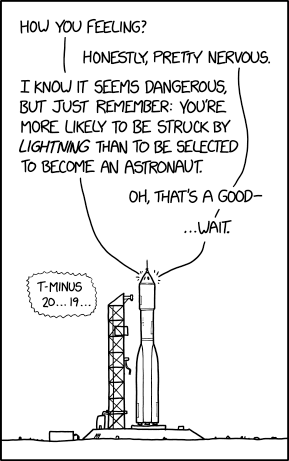 乗組員1: I know it seems dangerous, but just remember: you're more likely to be struck by lightning than to be selected to become an astronaut. Alt-text: Don't worry--you're less likely to die from a space launch than from a shark attack. The survival rate is pretty high for both!